February | 2010 | Long on short! This is an attempt to classify the clues by their type and analyse the crossword further. Do leave a comment if you differ in the classification of any clue. We find that of the 32 clues, the maximum are wordsum (WS) with 8 (I think that in any crossword usually these are bound to be more than any other clue type). Next in descending order: anagram (anag) 6 and double definition, also 6; cryptic definition (CD) 5; container contained (CC) 2; word sum with anagram (WSwAnag), also 2; wordsum with container contained (WSwCC) 1; cryptic and double definition (C&DD), also 1; and antonymic (Ant) also 1. This is an addendum to the usual blog on Daily Telegraph Cryptic No 26152 that I posted in Big Dave’s Telegraph Crossword Blog today ( http://bigdave44.com/2010/02/01/dt-26152/ ). Here I wish to analyse why I thought some clues in this crossword were more difficult than others in the same puzzle. This is not a plea to any composer that clues must be less difficult. I also realise that clues in some advanced puzzles can be even more difficult. 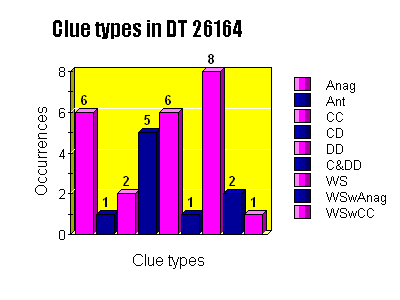 This is just an analysis to show beginners certain elements in certain clues that delay their solving. Let us take selected clues one by one. The problem here is that the solver is not able to grasp immediately whether the answer is in singular or plural form. The answer is delayed until he realises that clue is a cryptic definition and is to be taken as a whole. The ‘written evidence’ here is what is let out in court proceedings and what may lead to ‘convictions’, not in the sense of ‘strong beliefs’ but ‘decisions that the person accused is guilty’. One wonders why the composer thought it fit to use ‘convictions’, for I believe that ‘conviction’ itself has the sense of belief as well as a judge’s decision. A word that means ‘wither’ put inside the name of a general (an old general whose first name was Ulysses) gives the answer word that means ‘incline’. Here, ‘incline’ is verb in surface reading but as the definition for word required it is noun. Also, as long as the solver thinks that ‘general’ is an adjective in the sense of ‘common’, he won’t get the answer. An abbreviation for ‘account’ plus a word for a ‘priest’ provides the answer. If the definition had been ‘right’, ‘exact’, ‘errorless’ or ‘precise’, this clue would have been less difficult. The definition ‘reliable’ makes it hard. ‘Go’ is verb in surface reading but a noun as def for word reqd. It is this element that makes this clue hard. As long as we think of Angel fish as anglefish, a kind of shark, we won’t get the answer. Here we take a word for ‘fish’ and put inside it a word for ‘hesitant’. The def is angel. A word for ‘friend’ plus a word that means ‘states’,v., give a word for ‘talks’. ‘States’ in the clue has false capitalisation and it’s this adds difficulty to the novice. Cryptic definition. The answer is a number suggested by “A time” that may be by noon or midnight. “High-handedness” is when the hands of the clock (assuming that it’s an analog clock that we are looking at) point upwards. Excellent wordplay; the clever use of ‘high-handedness’ is something that beginners may find difficult. Definition cannot be just ‘go over’, for RECAPITULATE is ‘go over again’. But ‘once more’ comes after ‘to the enemy’. “Go over to the enemy once more” as a whole very well suggests ‘recapitulate’ for ‘go over to’ means ‘transfer allegiance to’. But when once one has capitulated to an enemy where is the question of recapitulating, so ‘once more’ seems redundant in this case. The answer is attainable but but it is not too easy. A prefix meaning ‘out of’ plus the title of a ‘religious work’. Definition: gets full satisfaction. I believe that if the definition had been ‘extorts’ ‘demands’ the clue would be easy (but that won’t do for the surface reading of the clue as written). Though ‘collect’ is a synonym of the answer word, it is not the definition. It is just an instruction to string together the letters of MESS, a word meaning ‘jumble’, in reverse order (‘up’ in this Down clue) and put SSEM inside ABLE aword that means ‘efficient’. What then is the definition? It is ‘fashion’. But as def for word reqd it is verb. Thus many elements make this clue hard. You are currently browsing the Long on short! blog archives for February, 2010.